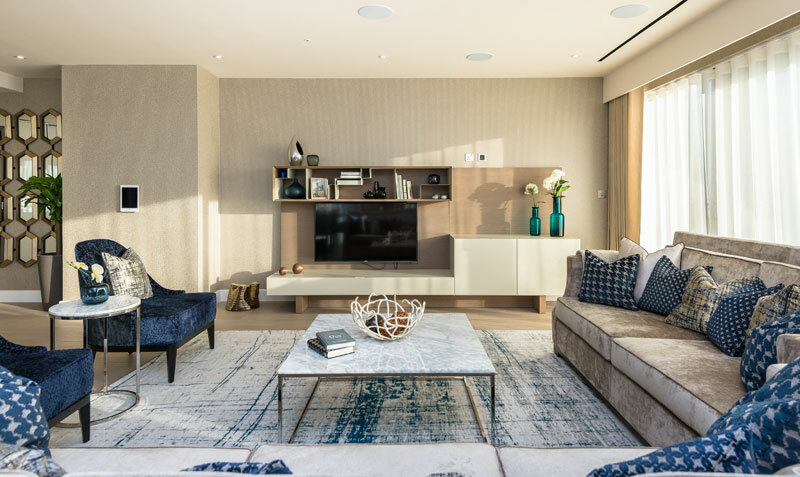 The impressive three-bedroom penthouse apartment Constantine House is the scene for ani M’s lavish and spectacular furnishing project. Bespoke design, custom upholstery and tailor-made furniture, this interior design scheme has it all. In the first consultation with the client, a colour scheme, wallpaper and fabric were chosen from the selection of samples and moodboards that had been specially prepared. In addition, a floor plan was drawn up that maximised the apartment’s space. It was a productive first meeting that enabled the interior designers to make informed decisions about what furniture would best fit the space and commission elements such as the upholstery which typically take longer to complete. The colour scheme for the large reception room is elegant; neutral tones of cream and beige soften the grey/blue hues, like a windswept beach in winter. Jab’s Oblivion collection was the perfect choice, luxurious velvet fabric in soothing tones of deep blue cover the easy chairs. The cream sofas and embossed wallpaper cushion the strong blue while rich, dark wood furniture brings a timeless style. Clever accessories continue the colour scheme with blue glass, ceramics and polished metal objects used to harmonise the space. Cleverly positioned mirrors and artwork catch the light and create a bright and airy ambience. Smaller items of furniture in chrome and glass keep a sense of space and proportion. The bespoke Rossetto TV unit was made specifically for the scheme and hides unsightly TV wires. The room feels welcoming and homely, yet refined. The walls of the long hallway are cleverly decorated with wallpaper from Vescom that has a fine horizontal texture to give the space a sense of movement and flow. Here, the neutral beige is enlivened by splashes of a vibrant blue/green, in the abstract artwork for example, to echo the reception room yet give this space a character of its own. 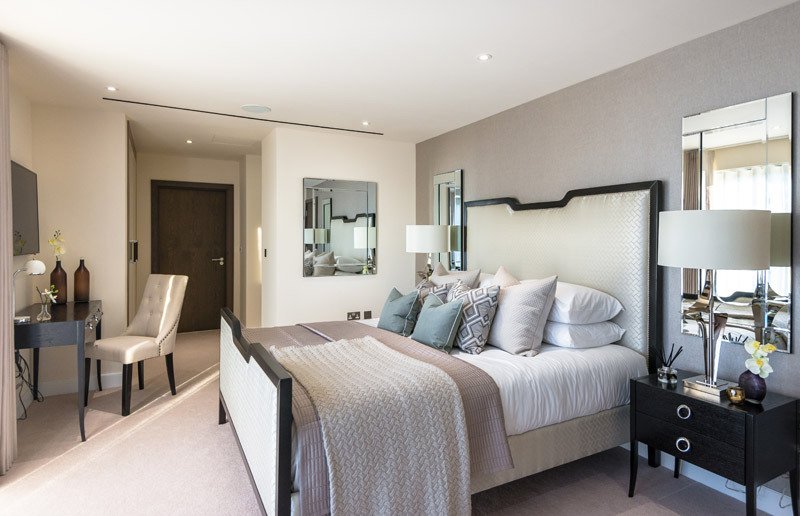 The same colours flow through the apartment;in the master bedroom, a subtle blue harmonises with grey and cream tones to create a restful sanctuary. Dark wood showcases the shapely lines of the headboard and furniture. 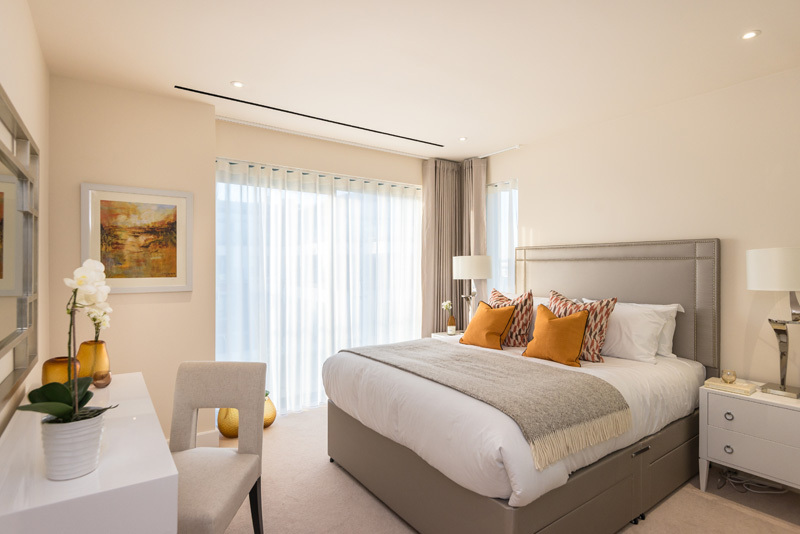 Only the second of the three bedrooms has an unexpected splash of gold and ochre to freshen the cream and white shades. It creates a sense of sunshine and warmth and feels instantly soothing. Throughout, strong design touches such as the ‘wall of mirrors’, tactile artwork, bespoke furnishings and even a show-stopping chandelier make this apartment a triumph. The apartment is a testament to high-end design and it is the design team’s attention to detail that makes this stand out. 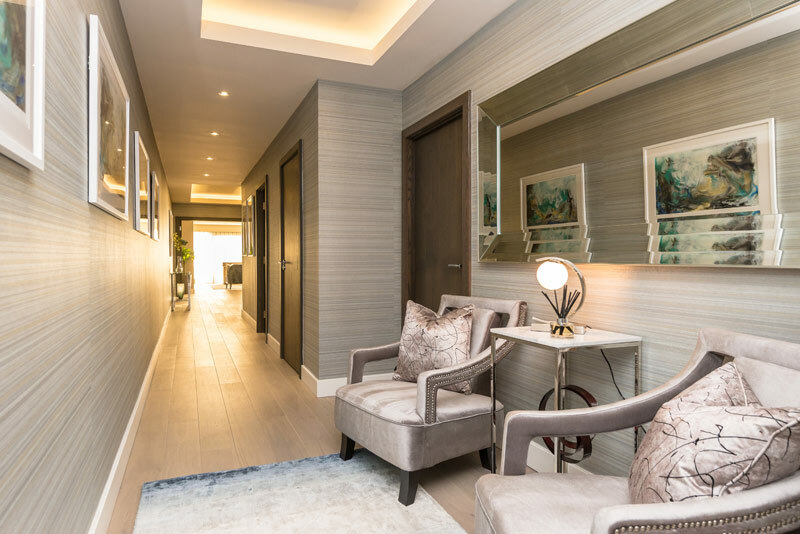 The team was tasked with creating a sumptuous and elegant apartment that made the best use of space and light. They excelled, creating a personal space that showcases timeless, contemporary design. 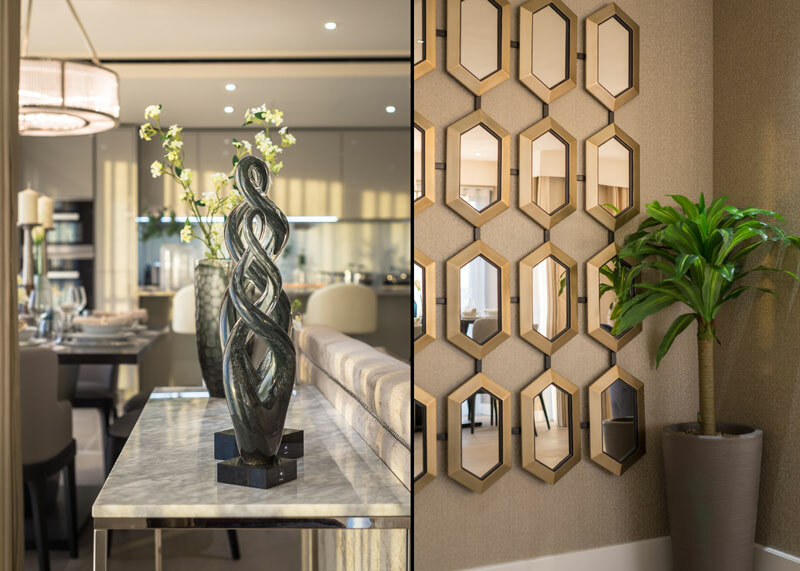 If you would like ani M’s interior designers to bring the same vision and attention to detail in transforming your home, then get in touch today.